Published: Oct. 24, 2015 at 09:28 a.m. Updated: Oct. 24, 2015 at 07:59 p.m.
LONDON -- Saturday morning operated as a dreamland for British fans of the NFL. London's Regent Street, normally a bustling thruway, was cordoned off from Oxford Circus to Piccadilly Circus to make way for a bursting celebration of pro football one day before the Jaguars and Bills do battle at Wembley Stadium. The NFL on Regent Street -- packed with interactive drills, giant inflatable tackling dummies, food and drink galore, full-throttle cheerleaders and a generous smattering of Buffalo and Jacksonville players -- served as a firsthand glimpse at just how vast the sport has become overseas in recent days. Walking the grounds with fellow Around The NFL colleague Conor Orr, we saw pro football fans of all ages: men, women, children and pets decked out in a kaleidoscope of jerseys honoring players new and old. We spotted duds touting Megatron, Charles Woodson, Howie Long, Victor Cruz, an Ole' Miss-era Eli Manning gear, Joe Montana, Tom Brady, Aaron Rodgers, Tony Romo, Russell Wilson, Gronk, a blonde in Cameron Wake garb, Dirty Birds-era Deion Sanders, Brandon Jacobs, Sammy Watkins, A.J. Green, C.J. Spiller, Peyton Manning, Fred Taylor, Fred Jackson, Zach Ertz, LaDainian Tomlinson, Eric Decker, Blake Bortles, Ryan Tannehill, Matthew Stafford, a small curly haired child in Paul Posluszny gear, Doug Martin, Joe Flacco, Jimmy Graham, Kyle Rudolph, Tedy Bruschi, Byron Leftwich, MJD (sorry, Ike Taylor) and LeSean McCoy. We spoke to the Leftwich-clad fan, Matt Harris, a teacher who noted that football has taken hold in the schools, saying that kids who always played soccer and rugby are "now also playing American football out on the fields," adding: "It's getting to that point where kids are buying into it. They know the rules, they know the game, they know the players. Over the past four years, I've really seen the shift." Harris was introduced to the Jaguars by his friend, Matt Wright, who told me he fell for Jacksonville "10 to 12 years ago" after vacationing in Florida. At the time he was more into the NBA's Orlando Magic, but returned from the voyage with a Warren Sapp Bucs jersey and a Jaguars cap. Tampa had just won the Super Bowl, leaving Wright to feel that he "didn't want to be that person" who band-wagon jumped, so he picked the Jags, who he'll watch in person on Sunday. Along the avenue, we witnessed a millennial in blasted-out skinny jeans and a form-fitting Rob Gronkowski jersey, but just yards away was a Jets fan, decked in green and basking in New York's 4-1 start. Nigel Sharnand, 22, told me he's been a Jets fan since 2012, when he went to the States to watch Gang Green face the Dolphins. He's followed the NFL since attending the first International Series tilt between Miami and the Giants back in 2007. "Every time I go out of the house now, I can't help but notice all the merchandise people are wearing," said Sharnand, adding that the NFL is "getting there" in terms of competing with soccer." That was evident after talking with Tim Barber, an Around The NFL Podcast listener who competes with the Wembley Stallions American Football Club after playing the sport at school. "I started playing at uni, so you have three years at uni and the team will give you the kit and stuff," Barber said, "... We're all amateur and do it for the love of it." A run-stuffing linebacker, Barber is another example of how the sport itself -- not just the trappings of daily fantasy football -- has captured Europe. It wasn't just on Regent Street, either. All week long, we've eyed examples of how the NFL is meshing into the fabric of this amazing city. As I write this, Orr and I are in the rowdy stands of a soccer match between Fulham FC and lavender-clad Reading FC. 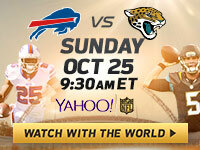 We're drinking in this contest, just as British fans will embrace Sunday's bout between the Jaguars and Bills. There's room for everything. The walls are coming down, the borders dissolving. It's a glorious time to be an NFL fan, no matter where you call home.